Now that the seats have been covered and are waiting to be installed by The Build team, it’s time to move back to the exterior. The wiring of the 1965 Chevy Malibu SS is almost completely finished, with everything done from the fuse box all the way to the front of the collector car. The engine is dialed in, and now it’s time to connect and run the wiring to the headlights and the turn signals. The wires will be hidden behind the fenders for a cleaner look. Once the body panels get mounted to the front of the classic vehicle, like the headlight mounting brackets, then they’ll finish up the front wiring and tuck the wires up and hide them for a smooth look. The wires are run and tucked out of the way so they are hidden well from the naked eye. 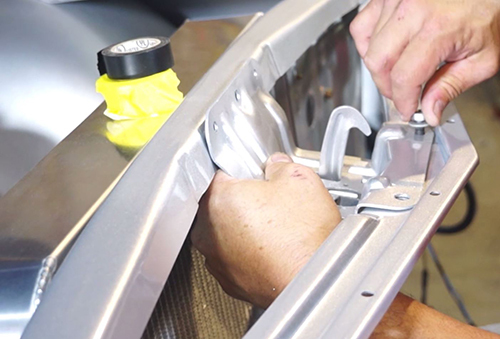 After installing the hood stoppers, Rick Drewry, American Modern’s Sr. Claims Specialist, will install the hood striker and latch assembly onto the hood. 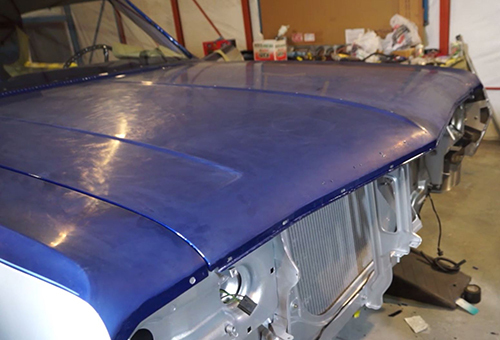 They’ll check to make sure the hood is flush with the side fenders and then move onto the next phase in the process of restoring the ’65 Chevy restomod. The latch needs to be locked in tight to remove any movement of the hood when it’s latched. There’s no reason to slam shut a hood, especially a classic car. They should be lowered slowly and then clicked when the latch is in the proper place. 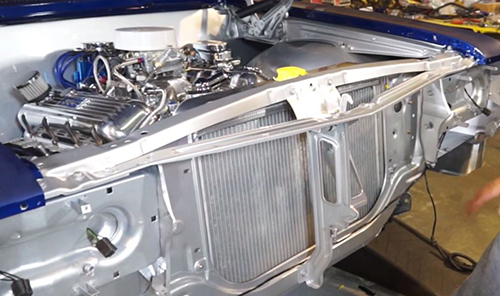 Now that the front hood has been installed and the wiring has been tucked, watch as The Build team continues to put back together the 1965 Chevy Malibu restomod. Make it a priority to watch the other episodes on our YouTube channel, and follow the progress of our collector vehicle on our Facebook page too!